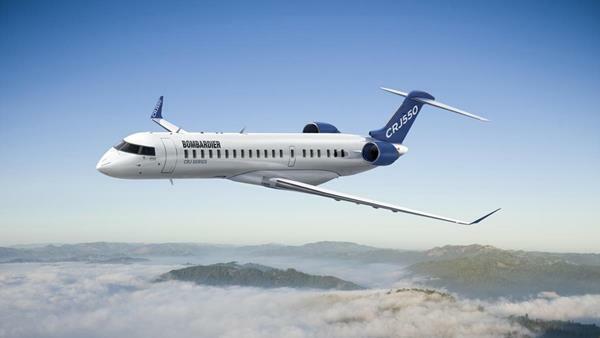 Covering the aerospace industry has its share of surprises and twists and the announcement of the launch of the CRJ-550 made early this morning by Bombardier is one of those events that no one had anticipated. It is an article that refers to the CRJ-550 and that was published in the early hours on February 6 in the USAToday that forced Bombardier ahead of the announcement of its new variant of the CRJ. The first observation we make is that the CRJ-550 is a CRJ-700 modified to have three classes that can carry 50 passengers and United intends to use it on routes of 900 nautical miles or less. The goal of United Airlines is to replace its CRJ-200s that can carry 50 passengers, but in a single class by CRJ-550 that will also carry 50 passengers, while having seats in business class, economy premium and basic economy. In recent years, the three major US airlines have retired a significant portion of their 50-passenger regional aircraft because their operating cost was too high. Since the CRJ-550 will be heavier than the CRJ 200, one would be tempted to conclude that it will be an economic disaster for airlines. But on the contrary it could prove to be very profitable since it will offer seats in first class and in higher economy. The business customer are the most profitable to the airlines because the price of the ticket in this category is often four to five times higher than that of the ticket in economy class. Being able to offer seats in all three classes will therefore enable United Airlines to significantly increase its revenues on regional flights where the CRJ-550 will be used. For Bombardier, now that it has a plan for the future of the CRJ, it will be much easier for it to sit down with CRJ suppliers to renegotiate supply agreements and lower its cost of production. As the collective agreement between Bombardier employees and the IAMAW has expired, it is quite possible that changes will be required to provide greater flexibility to the employer. It is still far too early to conclude that the CRJ program is back on track, but this morning’s announcement has the merit of shaking the cards and offering a new hand to Bombardier.